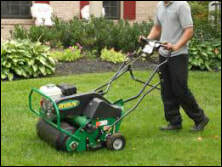 From Tools to Seed to Ice Melts: We have what your Property needs in this Area. "Whether you are a commercial landscaper or do-it-yourself homeowner, we have the product and expertise you are looking for. With 30 years in the business, our vision remains the same: provide relevant landscaping products, specialized knowledge, and exceptional customer service to our clients." Don't wait in line to get your landscape supplies! All our products are in stock, ready to be picked up when you need them. Aerators can be rented here.